Toronto Dogs Directory: Global Pet Foods’ Show Us Your Heart Fundraiser Is Back For Its 7th Year! Global Pet Foods’ Show Us Your Heart Fundraiser Is Back For Its 7th Year! 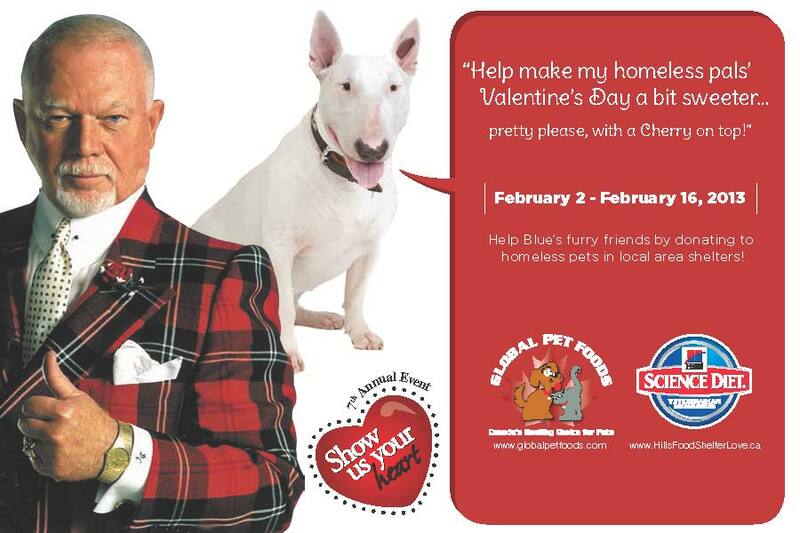 Toronto, ON—Help Don Cherry and Blue make this Valentine’s Day sweeter for homeless pets by supporting Global Pet Foods 7th Annual Show Us Your Heart™ fundraiser! are asking Canadian pet parents to donate as little as $1 to help raise funds for local animal shelters across Canada. To show your heart to homeless pets, visit any Global Pet Foods store from February 2 -16 to donate. Donate as little as a $1 in-store and Global Pet Foods and Hill’s® Science Diet® will match it. When you donate $5 or more in-store, Global Pet Foods and Hill’s® Science Diet® will give you 10 BONUS AIR MILES®† reward miles. Donations can also be made from your mobile phone by texting the word “HEART” to 20222 for a $5 donation. Plus enter the “Show Us Your Pet” contest at Facebook.com/globalpetfoods for your chance to win a year’s supply of Hill’s® Science Diet® pet food and other awesome prizes for your furry friend. Since 2006, Show Us Your Heart™ has raised over $400,000 for local animal shelters. Global Pet Foods is Canada's largest chain of pet food stores specializing in natural, holistic and organic foods and supplements, with over 150 stores across Canada and the United States.